Panoramic view of Pagân, looking W.
bl.uk > Online Gallery Home	> Online exhibitions	> Asia, Pacific and Africa Collections	> Panoramic view of Pagân, looking W.
Watercolour with pen and ink of a panoramic view looking to the west of temples and houses at Pagan (Bagan) in Burma (Myanmar) by Colesworthy Grant from 'A Series of Views in Burmah taken during Major Phayre’s Mission to the Court of Ava in 1855'. This album consists of 106 landscapes and portraits of Burmese and Europeans documenting the British embassy to the Burmese King, Mindon Min (r.1853-1878). 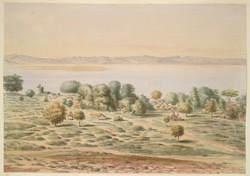 Grant (1813-1880) had come to India in 1832 where he lived in Calcutta and travelled to Rangoon in 1846. In recognition of his skill, he was presented with a gold cup and ruby ring by the Burmese King. Together with a privately-printed book of notes, his drawings give a vivid account of the journey, and a number were used for illustrations to Henry Yule’s ‘A Narrative of the mission sent by the Governor General of India to the Court of Ava in 1855’ published in 1858. More than 5,000 stupas and temples still stand on the plain at Pagan, an abandoned city on the east bank of the Irrawaddy which was the royal capital of an extensive Burmese kingdom between the 11th and 13th centuries. This image is one of six panoramic views of Pagan seen from different orientations that Grant sketched from a vantage point on a temple.